Our Eco-Pride Classic Lawn Care Program is a comprehensive program designed to make your lawn not only beautiful but healthy. A healthy lawn will be able to withstand the seasonal extremes that Kansas City weather throws at it. The secret to a healthy lawn is healthy soil. So how is Heritage Lawns & Irrigation different from other lawn care companies? Simple – we start with the soil and make sure it’s healthy. We limit the amount of chemicals we put on your lawn and we use environmentally friendly products. Rather than add chemicals to your lawn that kill off the bad and the good microbes in your soil, we focus on balancing your soil so it is naturally healthy. We don’t play the “see the weed, spray the weed, repeat” game that most lawn care companies play. We treat the problem, not just the symptom. A thick, healthy lawn is your best defense against weeds hands down. That’s what we strive to create. With the Eco-Pride Classic Lawn Care Program, you are on your way to a healthy, thick, beautiful, weed free lawn. Your lawn will receive fertilizer and weed control treatments at the proper times throughout the seasons. Grub control treatment and our exclusive liquid aeration are also included for a complete nutrition and protection package. Plus, with our Classic Program, you also receive one free bonus service of your choice. 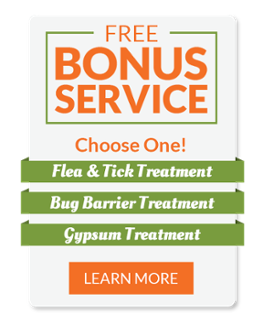 Choose from our family friendly Flea and Tick Control, our Bug Barrier perimeter insect control, or our Gypsum Treatment that helps add calcium to the soil. By choosing the Eco-Pride Classic Program, you save 26% over individual treatments. Plus, you get to choose a free bonus service. It’s a complete lawn care package, no matter if you are searching for the best lawn care in Overland Park, lawn care in Leawood, lawn care in Kansas City, lawn care in Lees Summit, MO or lawn care in Olathe, KS. To schedule Eco-Pride Lawn Care Programs, call (913) 451-4664 or fill out the form to the right and we’ll call you to set the appointment.